Checking and maintaining your hazardous gas monitoring equipment on a regular basis is essential for the safety of employees and for optimum equipment performance. A gas detector that has not been properly maintained could lead to a false sense of security. Without bump checks and periodic calibrations, the monitor’s reading could be inaccurate, which could lead to unsafe work environments. Know the typical lifespan of the sensors in your monitor in order to plan ahead. A simple bump test can be quickly performed to verify the alarms of the gas detector are working. Regular calibration is crucial to maintaining the overall working condition of the gas monitor. Keeping a record of sensor replacements and calibration performed will support a regular maintenance schedule. Always refer to your ENMET User’s Manual for the recommended calibration frequency, the parts needed for calibrating your equipment, and the calibration procedure. 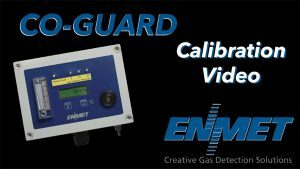 An excellent resource for calibration instructions for ENMET gas detection equipment can be found on the ENMET Equipment Video page or the ENMET YouTube channel. Instruments may also be sent into ENMET’s service department for calibration services, sensor replacements, and other repairs as needed. For technical assistance or instructions on sending your instrument in for service, contact ENMET service department at 734-761-1270, Monday through Friday, 8:00 AM to 4:30 PM EST.